When I was working at IH Newcastle, I taught the same group for 20 hours a week, four hours a day, divided into two two-hour lessons. That’s quite a lot of time with the same group, and yet I sometimes found it difficult to get to know the students with any kind of consistency or depth, especially because there was so much coming and going: new students could arrive Monday morning, Monday afternoon and/or Tuesday morning, and every Friday some students left. 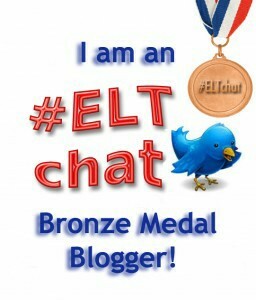 I decided to try an idea I’d first heard about at TESOL France in November 2011: journal writing. By the time I left Newcastle I’d done it successfully with groups at three different levels, with slightly different approaches in each case. When the students left my class and/or the school, I gave them their journals to take away with them. This was a group with a lot of Arabic students who were very reluctant to write generally, but who were very willing to write in the journals. I think this is because it was writing with a real purpose, and they could see that I was correcting them. It was also important for them that I was showing an interest in them as individuals, by responding to what they wrote on a personal level. There were non-Arabic students too, and the journals gave me a chance to see everyone’s writing regularly. With this group, I did the journals at the end of the lesson, which meant we didn’t always do them if an activity ran over. I tried to leave about 20 minutes, with the first 10 being for a regular spelling test, as this was a real problem area. All of the spellings in the test were collected from the journals – I recorded the mistakes in a list in my notebook, which I then put onto Quizlet. Each time we did the journals, I would dictate five spellings for the students to put in the back of their notebook. After the spelling test, they had writing time to respond to my comments and questions and/or continue the conversation in any way they chose. Sometimes I would ask them all to write on a specific topic. 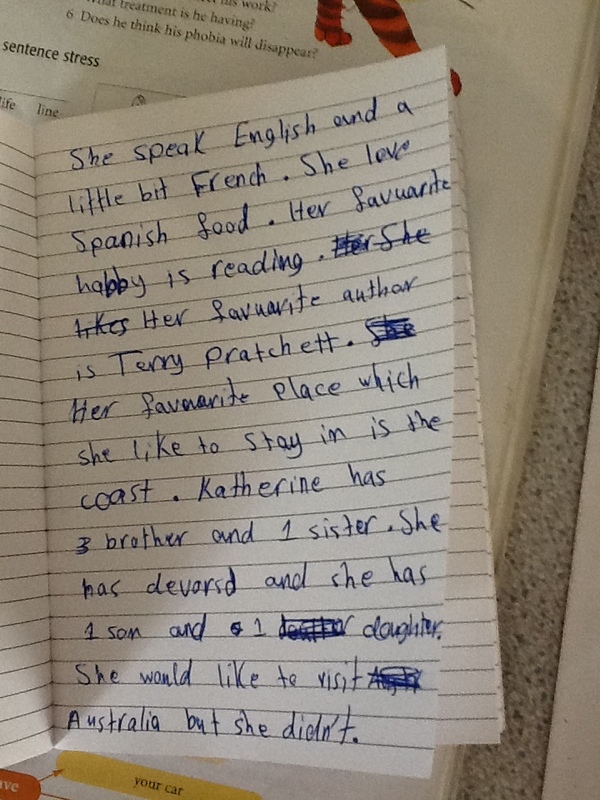 Here are some examples of writing they did after my mum visited the class, in which you can see the kind of feedback I gave. Despite the success of the journals with the pre-intermediate class, I didn’t start using them for a while with the intermediate group – I’m not sure why! When I did, I did a lot less correction with them. We also didn’t do a spelling test as part of the journal writing, although I did collect the spellings and do occasional tests and games with them in class instead. As soon as I started using the journals, the dynamic in the class changed and my rapport with the students really improved as we all got to know each other better. The quiet writing time at the end of most classes was also good for the more introverted students. Again, I didn’t start using the journals straight away, but I did use them for over two months. For the students who wrote them for that whole time, there was a marked improvement in the quality of their writing and in the length of their responses. What was quite noticeable with this group was that they really tried to incorporate new vocabulary and grammatical structures into their journals. Their written comments and questions were also sometimes language-related. For example, after a lesson on collocations with ‘get’, one student told me about all the phrases with ‘get’ he’d heard his host family use the night before. 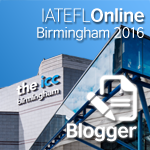 I finally learnt from my pre-int/int experience and moved journal time to the beginning of the lesson. 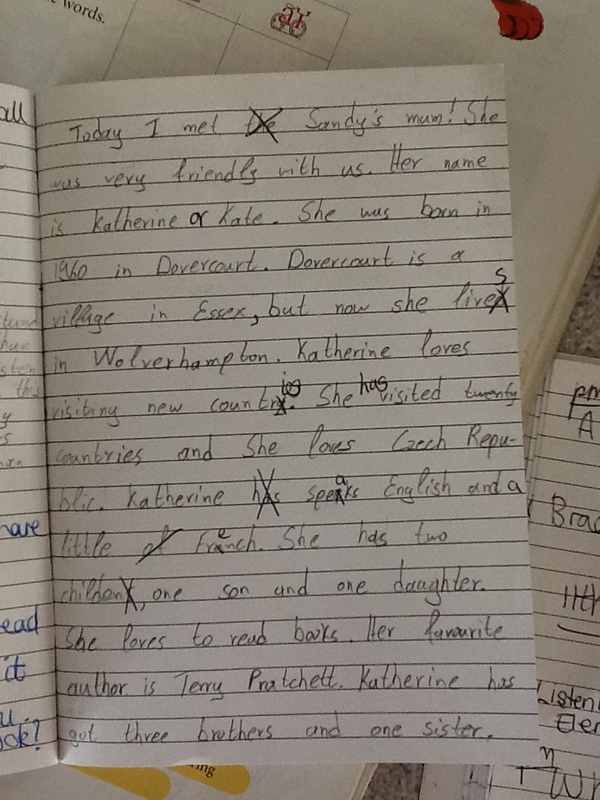 As students came in I gave them their journals and they started writing straight away. 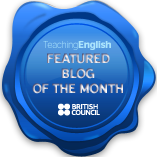 This was a great way to cater for latecomers, and gave the students the chance to write for as long as they needed to (normally 15-20 minutes) instead of being rushed by the end of the lesson approaching/arriving. While the students were writing, I would normally have a conversation with one or two of the students in a kind of mini tutorial. At this level I underlined problems/mistakes but didn’t correct them, so they had to ask me if they didn’t understand what the problem was. I could also use this time to talk about other areas to work on, unrelated to the journals, and to provide some intensive, targeted practice. What did you think about writing the journals? Do you think writing the journals helped you? How could I improve this activity? In my opinion, it’s a very good idea to get them pupils to write. It’s more interesting than other writing exercises, because it implies a conversation (between teacher and student). In all my other classes I barely wrote. That’s not very good because it’s one of my sticking points in English and therefore it was the perfect exercise for me. This student had been a bit frustrating for me, as I couldn’t seem to get through to him. 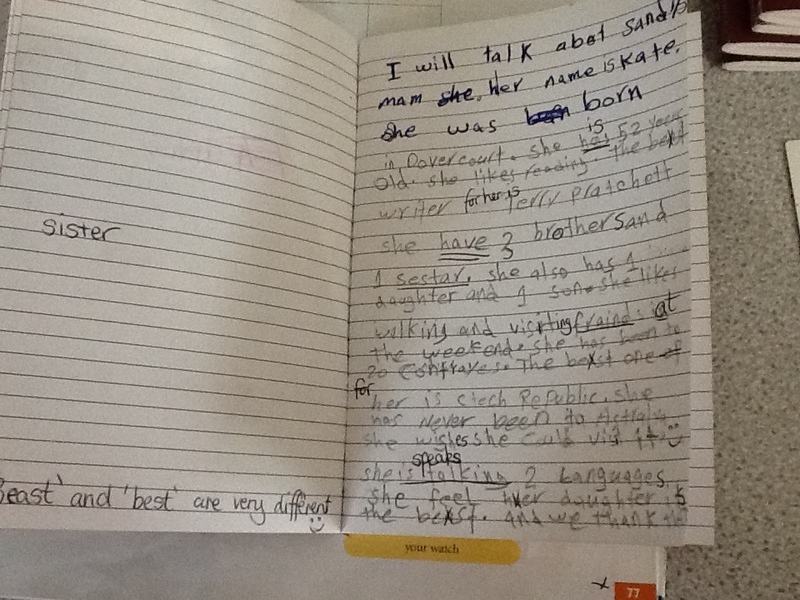 Writing the journal improved my rapport with him, and gave us things to talk about. It also really focussed on his weak point, which was writing as he said. I was pleasantly surprised by his feedback. 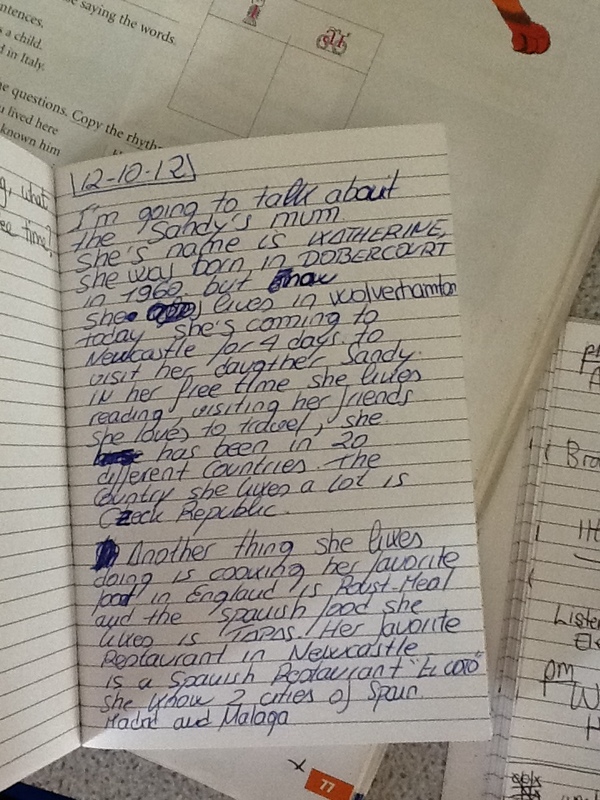 The journals are a good way to test student’s writing and get to know them, so I think it is very useful. It was a good experience. 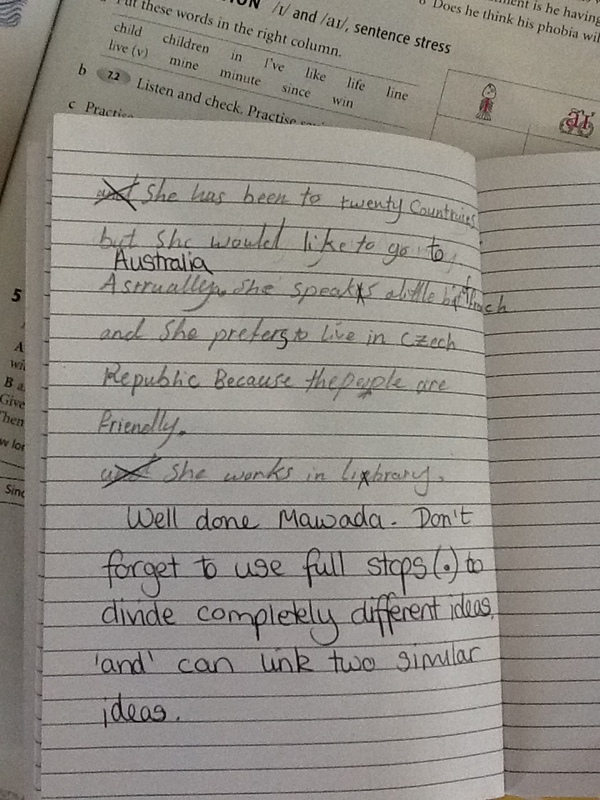 We tried to use the vocabulary we learned before so it was a good way to practise. It’s also interesting because we wrote about thing we like. How could I improve it? 1. I really liked writing the journal because it’s a way of knowing each other better and practicing my writing. It’s an interesting thing and I enjoyed doing it. The good thing is that now I’ve something to remember you! 2. As I said before I honestly think that it really helped me, because you corrected my mistakes and I hope I won’t make them again. 3. I’d say that you don’t need to improve it. It’s great the way it is!! It doesn’t need an improvement. I’ve never done it before. For starters I was surprised, but got used to it. – make language problems obvious. Sometimes I haven’t been aware of this à good to know so that I can work on it. – Go ahead with these journals, a piece of individual teaching in a large group!! 1. Very positive. Please go on with it. I think it’s positive to learn about your students. You can immediately evaluate them for their writing skill. For the students is good to write about their daily life. 2. For me it was helpful. Actually I know my weak point and I will try to improve it. 3. The booklet should be bigger. Nothing else to add. its very useful to me to increase the method of teaching learning since i found there are some problems related to the method i have applied to the students. Hopefully it will make some improvement. Thanks for this, I really appreciate it. Really interesting post! I’m a trainee teacher and it was great to see some typical errors made by students. It was also, for me, educational to read the students’ feedback. I’m glad you found that useful. You might also like to look at http://sandysstudents.wordpress.com for other student work. Good luck with your training! I have found journals are a great tool for getting to know students, especially those students who are sometimes more shy. There have been many times when I have felt that a particular student was not engaging with content or was uninterested and then they wrote something in their journal that demonstrated the opposite. I have a question about something you mentioned at the beginning of your post. You said you had been in a teaching situation where you were with the same group of students for a great deal of time each week but that you also had many transitions within the group week to week. This is something that I am seeing in my own situation and I have really struggled with learning how to make these transitions smooth as you are not able to cover the same content over and over for each new student but they have usually missed out on information that is being built upon in class. 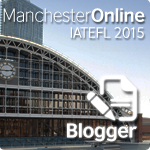 Do you have any advice on how to deal with the constant overlap of coming and going students? The continuous enrolment situation was something which I found difficult too, and i always meant to write a post on it, but never did. I think it depends what level you are teaching. With higher levels there is not such a need to go back and repeat things – you can cover new areas without too many problems as they already have a foundation to build on. With lower levels, it’s more difficult, and I found it particularly hard with beginners. I think with those students, it’s important to focus on functional language more than on grammar points. Teach them how to cope in certain situations, and give them vocabulary. This means that if you cover the same situation again it becomes a confidence builder,and a chance to memorise more language. In terms of grammar, you have to choose the areas which are most important, and pick and choose from coursebooks. It’s impossible to work through one book from beginning to end. I also used Edmodo.com with my classes, so new students could see what we had covered before if they wanted to. I’m not sure if that helps or not! Good idea. I’ve always wanted to implement something like this, but always fear the amount of time giving feedback may take given a class of 18 or two classes of 36. Students writing more and more is very hard to implement or enforce, even though we know it’s worth it for practice and improvement. This term, we do something a bit more content-related. They all belong to a Facebook book club to respond to discussion posts teachers start about the book they are reading. Quality of answers does improve over the weeks they do it. Someday I’ll give this journaling a more formalised try. Thanks for the comment Tyson. 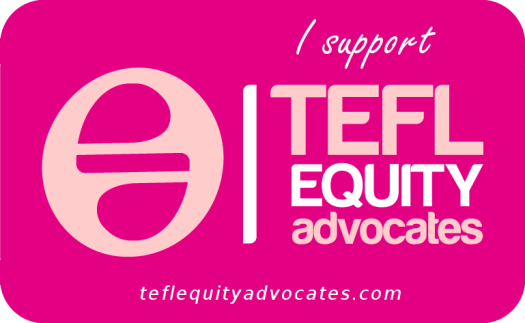 The person who presented it at TESOL France was actually doing it with large university classes, but I think she said it was challenging to keep up with. They did it for 15-20 minutes in one class a week if I remember rightly. A facebook book club sounds good – making it part of their normal lives. How many respond to it? I’ve tried doing things via Edmodo, which they’re using in my classes anyone, but I’m lucky if one student responds. Out of 26 in the group, I have about 8 that interact regularly so far and with quality interaction. In the end, they all have to eventually as it is worth 3% of their year’s grades. Is there any requirement in terms of the number of times or the frequency of their communication in terms of getting it credited for their 3%? Yes. I told them 75% of the discussion posts should be participated in, and in the latter half of them, they need to either ensure their answers are unique or comment on a previous person’s reply. It’s amazingly simple and useful, I love the idea and I’m eager to try it. I’ve heard of the idea of writing letters/emails to students where you introduce yourself, to build rapport and get to know each other when you just start, or sending them letters from time to time, but this way is better, because students can see your corrections and everything is in one notebook, so they always can go back and see their progress, which is good for students’ confidence, I believe. 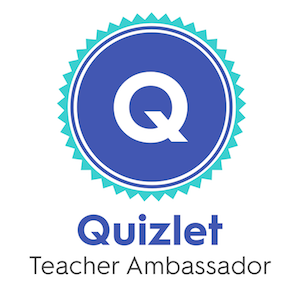 And, yes, I ‘m thrilled with that app(Quizlet)! I ve been using Anki so far, but Quizlet looks more convenient. I’m not sure how much I can help you, but I’ll do my best. Where do you want to teach? That makes a difference to the kind of course you need to do and the best place to do it. Do you already have a degree? I you do, it’s best to look for a Masters. If not, it’s probably best to do an undergraduate degree in your country first. There are a lot of courses for teaching in the UK, and I don’t know enough about them to be able to recommend one in particular. The best place to find out about them all is the UCAS website, which is the UK University and Colleges Admissions System. You can search for courses across the country on there. Hi Sandy, I enjoyed reading your post! I share the same belief about journal writing in the learning process. I’m currently using journals in a school project about art in the english class with 6th graders, mainly as a means to reflect on the whole procedure. You can have a look whenever you find some time. Thank you!